Today was quite productive. This morning we drove to our local sheet metal shop. 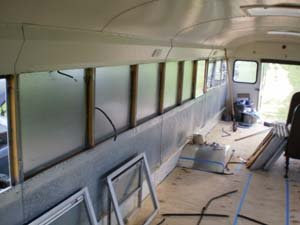 I gave him all the measurements and patterns so he could cut all the metal we needed for covering the windows. He informed us that it would be done about noon the next day (Wednesday). We ran some errands and drove back home. We had been home for about 30 min. when he called to inform us that the metal was all cut and ready to go so I went to pick it up. The owner of the sheet metal shop is a really nice guy and he gave me a lot of advice and help. 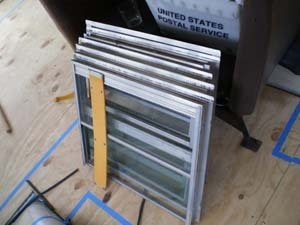 4 - sheets of 20 gauge galvanized metal for covering windows. 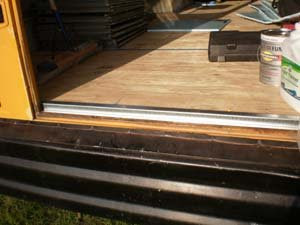 1 - sheet of 20 gauge galvanized metal to cover the side emergency exit. 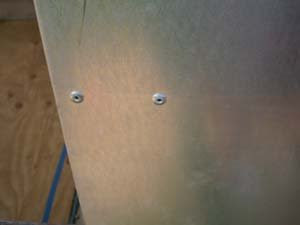 4 - small sheets of 20 gauge galvanized metal for covering the flashing emergency lights. A bag full of rivets... and he let me borrow his rivet gun for FREE! All this came to $120.00. I thought that was a great price for custom cut, custom bent metal. 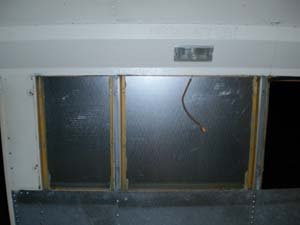 The first thing I did after I returned with the metal was to remove the windows where ever the metal would be going. 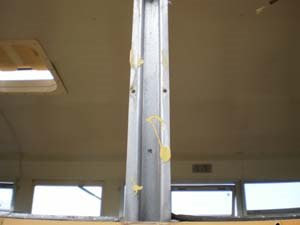 I found that the fastest way to do this was drilling the rivets out from the inside of the bus rather then the outside. Get some REALLY GOOD drill bits. I probably went through 10 drill bits today. Just crazy. This metal is REALLY strong stuff. After all the flanges were removed I scraped off all the old glue that helped hold them in place. 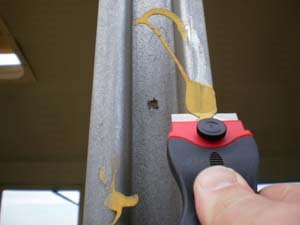 For some reason the blades on these scrapers did not like the metal and kept breaking so I ended up using my utility knife and although it was a little harder to get to it did work better. 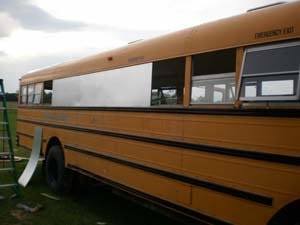 Now that all the old glue was off, the bus was now ready for the metal. I used Liquid Nails on all the metal framing that the sheet metal would be resting against. 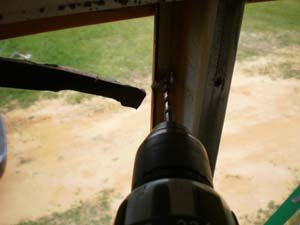 This is important because it will help reduce the rattling of the metal. This was my first time doing rivets and I was glad that I asked my sheet metal friend some advice on this subject. 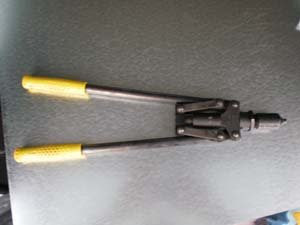 Get a good rivet gun like the one pictured here. This will save you time and energy. Don't go the cheap rout. 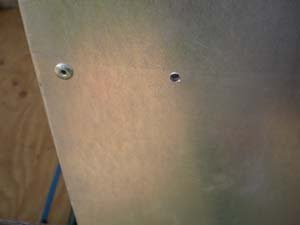 Once I had the metal in place I drilled a few 3/16 holes for my rivets. 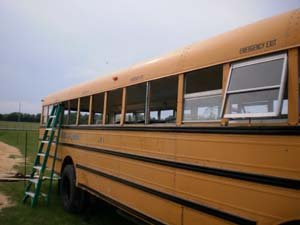 After I installed a few rivets I went inside the bus and drilled pilot holes so I could easily drill the holes from the outside. This eliminated a lot of guess work. After that we just drilled out our pilot holes and put the rivets in. We had one seam where a piece of metal overlapped another. 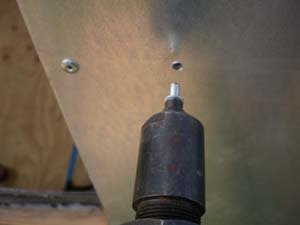 On that seam we put the rivets close together to insure a good sealed seam. 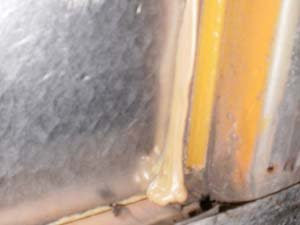 I also sealed this seam with some 50 year, paintable caulk. Here is the finished product from the outside. There will be plenty of room to fit that construction foam in each window frame. That will help with sound and heat. We basically followed the same steps for the drivers side. We have almost all the metal up. All that's left is the emergency exit door and a few more windows. Should have the metal done tomorrow. After I was done messing with the metal for the night I went back and filled any gaps I saw on the inside with Liquid Nails. 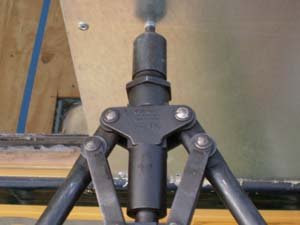 Here is a picture of the custom made flange for the rear exit door. It still needs to be screwed into place after the flooring is done. It is just sitting there for now.